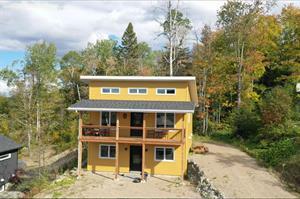 A beautiful cottage with a fenestration out of the ordinary for nothing lose the landscape breathtaking. 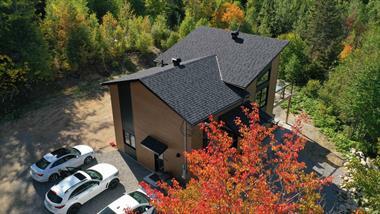 It is located in the new development of the Alpine village of Mont-Édouard, near Edward baths. The view is magnificent mountain is a construction neuve (2013). A gallery of 50 feet to admire this landscape and a patio door in the master bedroom gives you access to a beautiful 12 X 12 patio. 3 bedrooms 1 master bedroom, Quenn size bed with walk-in closet upstairs and patio door 2 rooms on the ground floor with a double and queen bed which can accommodate a single bed (available) or a (available) baby Park family room with table game air hockey on the ground floor and reads retractable (double bed) 2 bathrooms one with shower (floor) ceramic and glass doors and the other with bath-shower washer and dryer. Kitchen very well equipped with walk-in closet, dishwasher, microwave, stove raclette and fondue, drip coffeemaker and espresso dining room with door-garden giving access to the gallery and a magnificent floor heating on the ground floor living room with propane fireplace. "Entrance hall organized the vacuum cleaner sports central access unlimited internet access to the cell phone (Virgin Bell Telus Koodo) TV and cable upstairs bedding is included and everything is stove BBQ outdoors here are some comments from our customers:." It is a magnificent residence and comfortable, we have a great stay and will come back"it is true that your view is magnificent"Despite the weather, we much enjoyed our stay, we made snowshoeing and cross-country skiing, thanks for your snowshoes!" The children enjoyed themselves with air hockey table"
Espresso coffee, stove fondue and raclette. Park and high chair for baby. Christmas time 1900$ Maximum 8 pers.